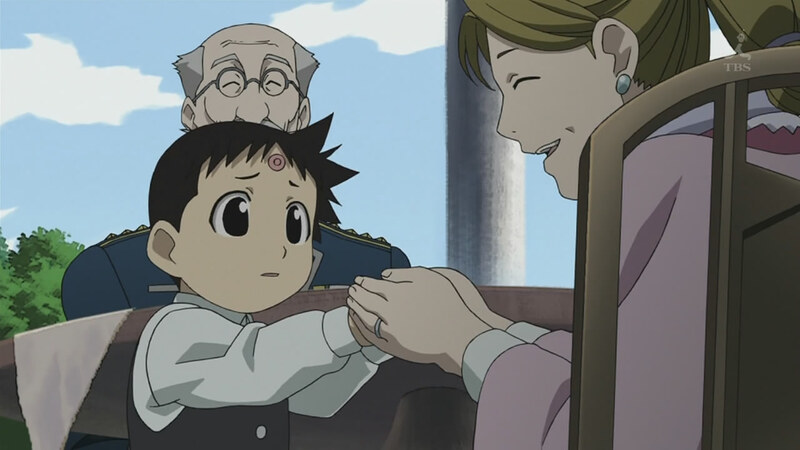 In the aftermath of the victory over Father, Ling reveals to Mei Chan that he has a philosopher’s stone and makes a promise to her to take care of her and her clan as well as all the others, showing that some of Greed still resides in him. In the hospital, Roy has his old staff with him as he trains to become Führer and to help the Ishval people. Dr. Knox and Dr. Marcoh pay him a visit and reveal they can restore his eyesight with a philosopher’s stone. Roy agrees but first wants to heal Havoc. At the Armstrong mansion, Scar recuperates and accepts a job from Olivier whereby he and Major Miles will work to save the Ishval culture. Olivier has another motive, namely irritating Roy over Scar being alive. 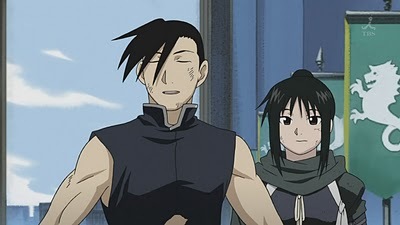 Ed and Al return home to Resembool and to a happy Winry. Two years later, both brothers decide on a new life plan — Al will head to Xing and learn Alkahestry from Mei Chan before continuing east. Ed will head west and learn. Al takes time to visit some people, including Hughes wife and child before hooking up with Zampano and Jerso to begin his travels. 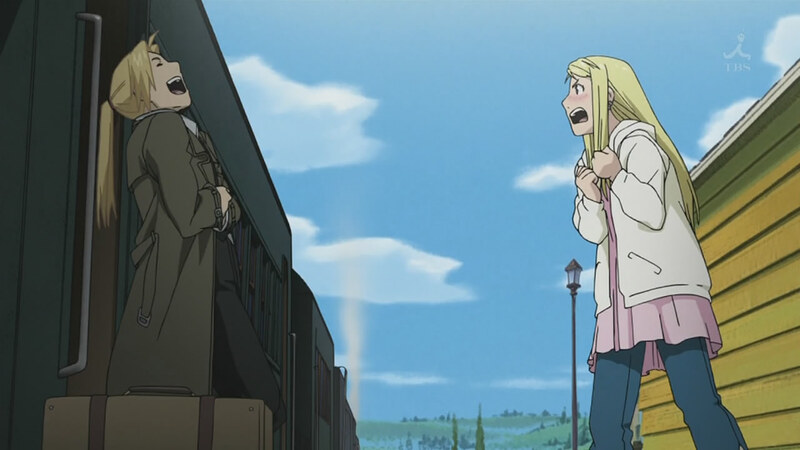 Meanwhile, Winry escorts Ed to the train where he manages to get out a weird, alchemist confession to exchange half lives with each other. Winry doesn’t care for the delivery but her response about giving him all of her shows her acceptance. Elsewhere, Führer Grumman is paying a visit to Bradley’s widow. Selim is now two and apparently has no memories of his life prior to being reduced to an embryo. Bradley’s wife is raising him properly and Selim seems a gentle, happy child. Grumman reminds her that he’s having the child closely watched, should Pride re-emerge. More time passes with different cast members shown in photos, including a group photo of Ed and Winry with two young children along with Mei Chan, Al, Xiao Mei, Paninya, and Garfiel. Despite being an aftermath episode, a lone surprise still awaited me. 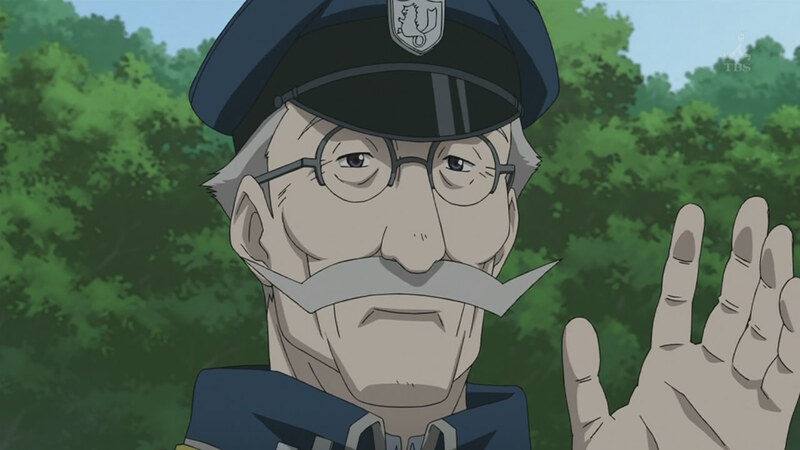 I did not expect for Grumman to become Führer despite those of you who felt I should consider him in the running. To me, despite his ambitions, he was a minor character in the grand scheme of things and thus Roy was to be Führer. 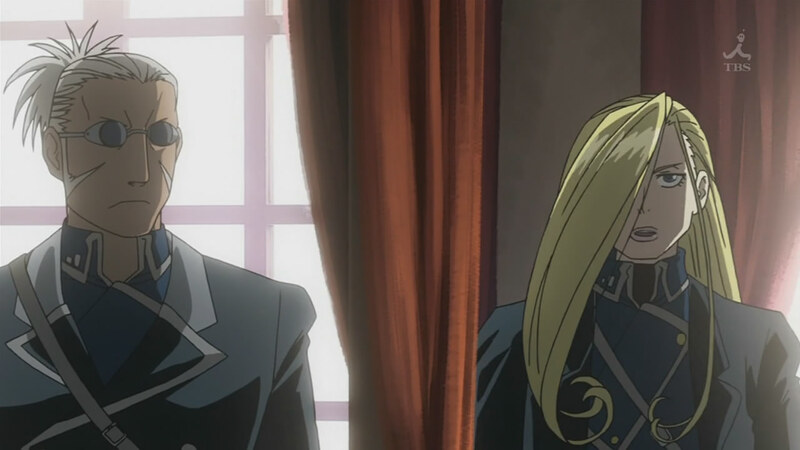 My only question was how this would be resolved between himself and Olivier, who could certainly take over the reigns of power. Having Grumman be Führer resolves that for a while, though I’m guessing Roy takes the reigns later in life (and with a stupid mustache). 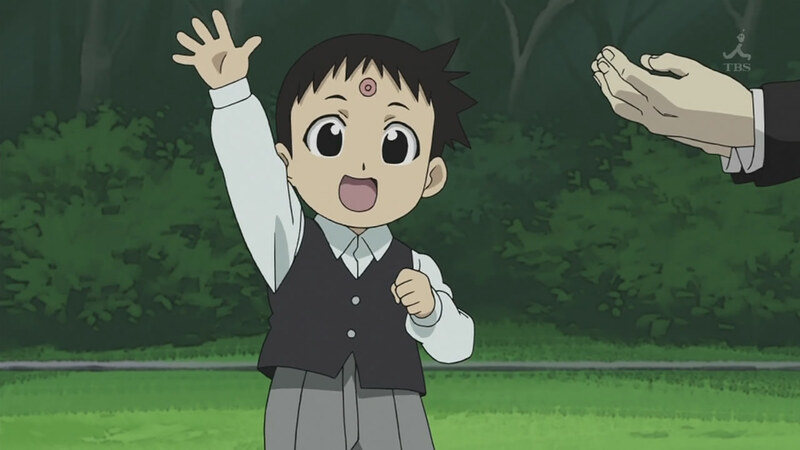 Now, I’m assuming that Selim is still the homunculus Pride though without any memories of that past experience. So, what is enabling him to grow like a normal human child? 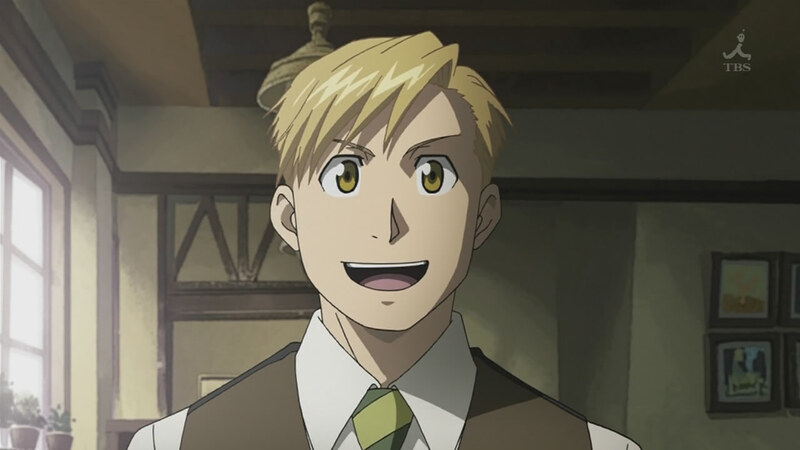 I don’t know if the manga answers that question, but I’m just pointing out that only Bradley had grown old and that was due to the unique circumstance of his becoming a homunculus. Anyway, I still say it is dangerous to let him live but that is addressed by Grumman’s remarks on having the boy watched. That, at least, is a smart thing to do. With everyone on the “restore Ishval” bandwagon, I did get a chuckle out of Olivier’s ulterior motive in recruiting Scar for that task. Still, I think that by now, Roy would not be that put out by Scar being alive, nor by Olivier putting him in charge of part of the Ishval restoration project. I wasn’t clear on it, but what exactly was Ed going to learn out west. Anything? Alchemy (starting from scratch again)? Al’s trip east made more sense to me since (1) he learns Alkahestry and (2) he hooks back up with Mei Chan, who’s a looker when she gets older. I like the implication that Mei and Al may be an item since she comes back west with Al at some point. Back to Ed, I was kinda hoping that when Ed started his journey, he’d have Winry with him. It didn’t go down that way, but we get another implied payoff with Ed and Winry apparently married with two kids by the time it is all over. There was one thing missing from Ed and Al’s return home — visiting their parent’s grave. 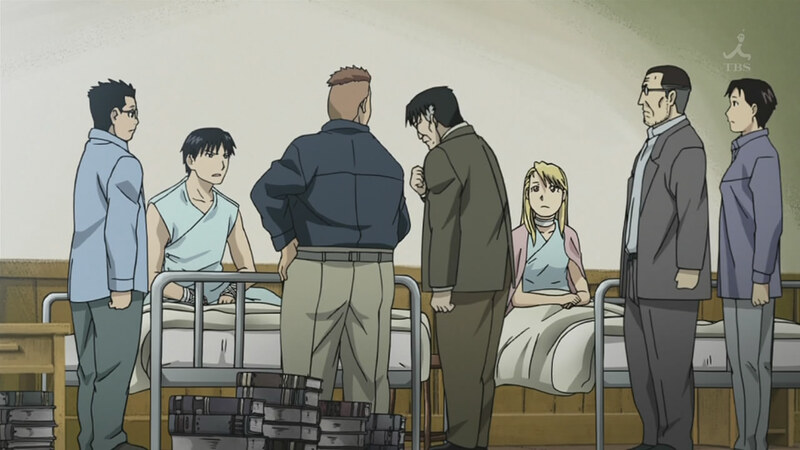 I rather assume that Pinako had Hohenheim buried next to Trisha and it would have been a nice touch for the brothers to stop by the grave before moving on to Winry’s house. I’ll write final thoughts on the series later, but for now, I have to say that this episode was pretty nice and certainly an enjoyable aftermath episode. hmmm odd that that would have been cut. in the manga on one of those photos you see showing all the different characters, is indeed a photo of both of their graves side by side. – Actually, start reading from the end of page 67! – Also, look in the upper left corner of the page: http://www.onemanga.com/Full_Metal_Alchemist/108/110-111/ – a difference in the anime and manga. But overall, the episode sticked pretty close to the manga material. P.S. Also, as far as I remember, Mustang didn’t cure his eyes. I might be wrong, of course. So, the anime has a little bit more happy ending than the manga. Actually if you go back to the Bulletin Board at the end with all the pictures, and hit freeze, you’ll see a picture with Pinako standign in front of both Trisha’s and Hohenheims graves. And is anybody else confused how that dang Panda that Mei-chan has didn’t grow any over the years? You know what has been bugging me? How old are Al and Ed in the final episodes? ‘Cause to hear that high voice come out of what appears to be a young man in his mid to late teens is a little…odd. I have to say this episode makes alot more sense than the old anime’s ending. Which had so many elements that bugged me. 1st: through the door was standard Earth, huh? and that they decided to say that their world was magic based and our world science based (thus the magic land vs science land bit) but their world has cybernetics for crying out loud so is 1920’s Earth the science master of the two? 2nd: Al’s memory being lost. My most hated of all cliche endings, what was the point of the whole journey and all its life lessons if the whole thing is forgotten? Thus this ending is the much greater of the two. 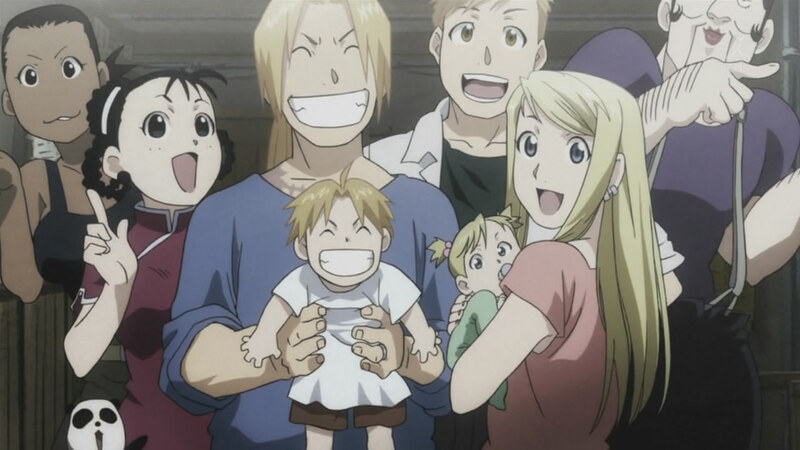 Plus anyone else notice Ed is finnaly taller than Winry when they have kids? Now that this is done, what the hell will the movie be about? I can’t think of anything left, and their journeys I would think wouldn’t be movie worthy. Maybe. Yes, there is a FMA movie announced, if you hadn’t heard. @SaCul — thanks for the info. @Anon — Considering it was a runt from the start, I wasn’t surprised. @O-chan — *lol* Yeah, the voices don’t match the men they’ve grown into. @Rhuen — Yeah, this anime series makes the first unwatchable as far as I’m concerned. @Anon — While the first anime series had a movie sequel, I’d suspect that any movie would be an abbreviated version of the TV series. A lot of anime movies are like that, unfortunately (the “Blue Gender” and “Shakugan no Shana” movies spring to mind off the top of my head). @evgenidb In the manga Roy does cure his eyes, but does nothing for Havoc. In the manga, the stone is a toll to be paid to God, which they think will be equivalent because Roy was forced to do a human transmutation against his will. There is a picture at the end of Havoc rehabilitating his legs though. 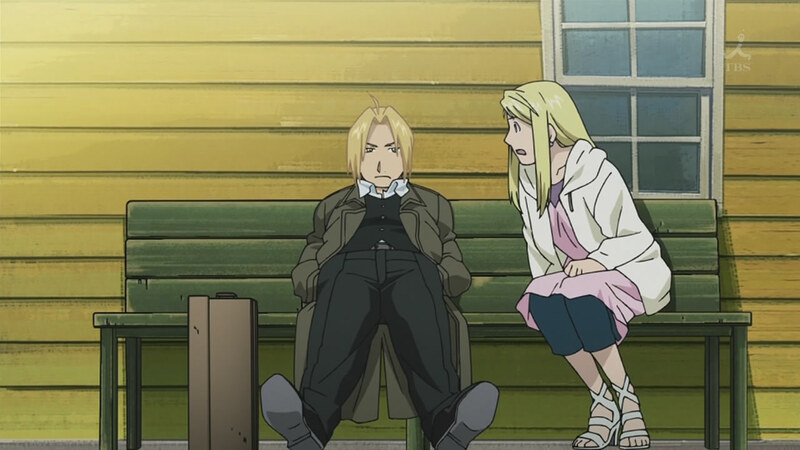 @Rhuen Ed has been taller than Winry ever since the jump in years, at least that is how it was in the manga. Ed was always shorter because his body was supporting both him and Al, you should even see it in the train station scene Ed should be taller (again if you go by the manga as I have not watched the anime just yet). @Rhuen: About the 1st – Our “scientific” Earth have flying machines like planes and dirigibles, rocket science is just starting, Einstein was mentioned. For Ed and Hoenhaim, that’s something completely new and they are not used to it. On the other hand, they are quite familiar with cybernetics and that wouldn’t impress them at all. In the “alchemy” Earth science is progressing alongside alchemy. So it’s normal that the sciences in both worlds would somewhat differ. I always thought Roy did heal Havoc in the manga – although it was never stated. In one of the pictures on the last page he’s struggling to learn to walk again. When he was first injured the doctors said his nerve endings were completely shot so no matter what he’d never be able to walk again or even get automail. So the fact that he’s working to walk again in the end makes me think that Roy used some of the PS to heal his legs. @evgenidb: it wasn’t about what was impressive to them or new. Its how the concept was sold. Its a cliche to have two Earths, one science one magic. However trying to sell the series like that is illogical as despite one having flying machines, the other still had science like cars and cybernetics. Meaning that it wasn’t a proper gimmick. Thus it makes alot more sense that this wasn’t the case in the proper Manga version like now. *our world is based on Alchemy, their’s on hard science* just doesn’t cut it when one can make cybernetics with science and not not alchemy, despite rocket fuels and what not in the other. I was under the impression at the beginning of the series, and all through this new one. That either their world is totally unrelated to Earth (like Slayers) or took place in some distant future with magic and science mixed together (like Vampire Hunter D). So flip side fae realm stuff just didn’t sit right and I’m glad its not the case with the new series.